To welcome the inaugural drop of Camoshita on The Rake, we take a look at the Ivy League motifs that have influenced founder Yasuto Kamoshita. Pictured at Pitti earlier this year, Kamoshita-san uses a variety of muted colours and contrasting textures to create a seamless Ivy League look. Picture Milad Abedi. If you've ever spent any time in Japan, or even just take a passing interest in Japanese style, you will have noticed that when the Japanese discover a fashion or style genre they like, they go all in. No toe-dipping, no experimenting at the edges, just all-in. Take denim for example. Want to buy the very best raw selvedge jeans? Well, don't look in America, the home of denim: you'd be much better off trawling through Daikanyama district in Tokyo. Want to find the biggest selection of niche Italian tailoring brands all under one roof? Forget going to Italy: head to the Strasburgo department store in Minami Aoyama. Want to dress like a gothic Manga doll with a predilection for pink pigtails and nurses' uniforms? Shibuya has your name written all over it, sir. You see where we're going with this. In short, the Japanese don't do things by halves and neither does Yasuto Kamoshita, co-founder and creative director of Japanese brand United Arrows. Kamoshita is one of the most photographed men on the style circuit and not because he dresses like a flamboyant peacock or an eccentric lens lover. In fact, Kamoshita-san is the poster boy for a reserved yet elegant Ivy League style that he has had a big hand in perpetuating, evolving and perfecting in Japanese menswear circles since 1989, when he co-founded United Arrows with friends Hirofumi Kurino and Osamu Shigematsu. His personal style draws directly from the fabrications and silhouettes that were so popular on the campuses of Harvard, Princeton, Yale, and Brown in the late 50s: smart off-duty clothing in a muted palette, inspired by the 'sportswear' of the 1920s. In 2007, Kamoshita-san decided to launch his own namesake label under the United Arrows umbrella - Camoshita - to better represent the Ivy League style he carries off so well. When thinking about Ivy League style, it can be easy to smudge it in under the circumscription of 'preppy' but this would be incorrect. Preppy is a spin-off of the original Ivy league motifs, the main difference being it is punctuated with brighter colours and bolder patterns such as Argyle check. The Ivy League workwear that Camoshita creates more closely references the original and relies on a restricted palette of autumnal shades - think moss green, mustard yellow, browns, greys and creams, all very versatile hues that can easily be assimilated into any smart contemporary wardrobe. This season, The Rake's first tranche of Camoshita's AW18 collection is rich with earthy tones and textural diversity. A tactile sports jacket with peak lapels comes in Donegal wool with a soft Japanese construction that takes its cues from Italian tailoring. Pair it with a denim shirt or slip it over a dark rollneck jumper for a smart look in colder weather. 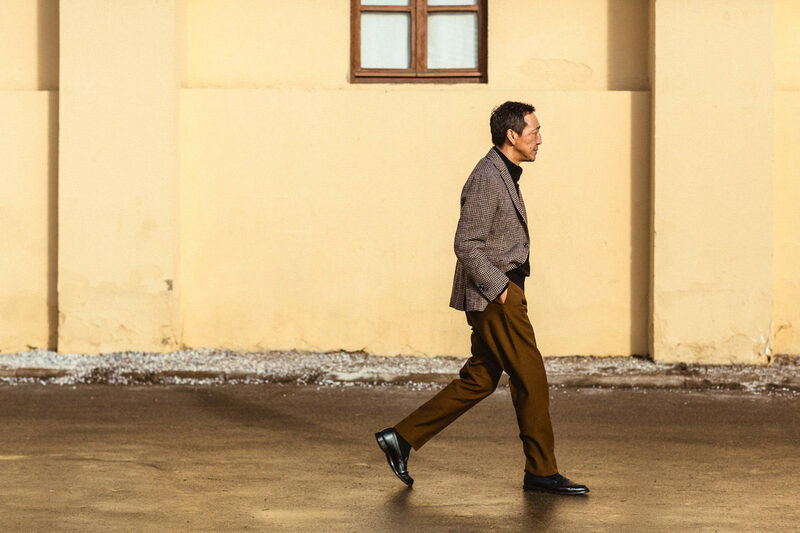 Camoshita's beautifully tailored pleated trousers (available in both beige and khaki) will definitely become your go-to autumnal slacks. Smartly cut in the leg with a single pleat in the front, they're perfect with just about everything and will marry with a versatile range of shoe styles. You can put a roll in the leg and wear with rugged hiking boots or wear with a break in a more classic fashion and opt for leather sneakers or chunky derbys. Finally, the tobacco duster coat, which derives its heritage from the long riding coats that late 19th century horsemen would wear to protect their clothing from mud and dust, is smart enough to layer over tailoring, yet has a definitive workwear aesthetic that can be thrown over a knit and some jeans at the weekend.